Integro Technologies is an innovator in machine vision and system integration providing turnkey solutions, consulting and support services for a wide range of industries including aerospace, automotive, food & beverage, pharmaceutical, medical, and military. Integro is AIA Certified and the top Cognex PSI in North America. 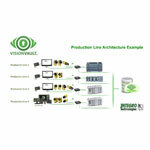 Integro works with over 500 clients worldwide on their most complex vision integration solutions. Integro’s staff is well-trained, leveraging a combined industrial vision experience of over 330 years of hands-on experience, and they currently have offices and dedicated resources in North Carolina, South Carolina, Ohio, Virginia, Maryland, Tennessee, and Indiana. A few of Integro’s partners include: Cognex, MVTec, Keyence, Omron, Opto-Engineering, Schott-Moritex, Yamaha Robotics, KUKA Robotics, CCS America, and Basler.